This is my easy to make pattern for Sasha, Toddler and Baby. 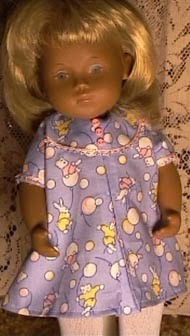 The pattern includes Dress in two sizes for the 16 inch and 13 inch dolls. The pattern is very simple and would be enjoyable for both beginners and experienced sewers. 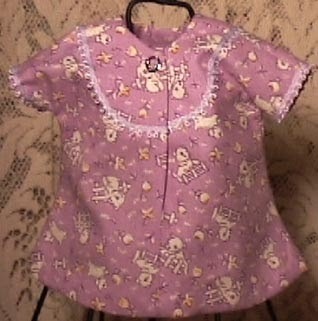 I have hand sewn some of the dresses and used my sewing machine on the others. This would be a great "take along" project as there are not many pattern pieces. 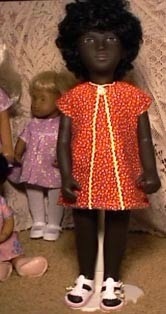 This simple little dress is so easy to sew and in no time you have made a wonderful little outfit for your doll. I use fat quarters for all of these dresses. 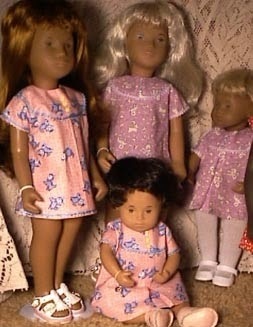 You can make matching sister dresses for your Sasha's and Toddlers and Baby's which would be very sweet. I have made my dresses up in spring fabrics. Pattern emailed with $8.00 payment.